Take a look at the waves in our Surfs Up Address Labels series. These are the waves that draw the adrenaline junkies to the surf. Surfing actually includes any pastime that involves being carried to the shore on the crest of a wave. Therefore, we can include longboarding, shortboarding, and boogie boarding, as well as other associated sports like wind surfing, kitesurfing, paddle boarding, and sea kayaking. Feel the ocean waves and grab your gear because the surf doesn't wait! 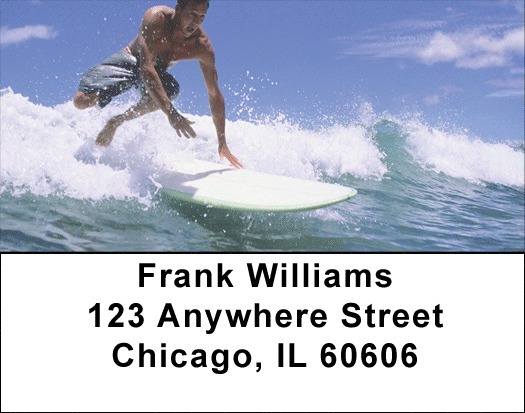 Surfing Labels - Get out of the office and into the water with these extreme beach surfing Address Labels! The perfect way to spread a little bit of fun and relaxation with every errand you run, these Labels are out of the box and are a great alternative to the bland standard.